Every cvc words list in this section shows short vowel sounds that are easily learned as cvc words. On this page you’ll find lists of all the cvc words that are appropriate for kindergarten. In bright colors, these lists are sure to dress up your room and attract little eyes. Make a word wall just of cvc words! Why not? Have kids use a pointer and practice. Please go to this page to see all the kindergarten phonics resources on this site. Digital paper from Striped Elephants. 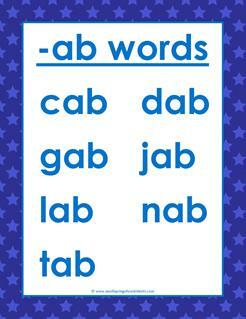 This deep blue cvc words list of -ab words has all the words in the -ab word family: cab, dab, gab, jab, lab, nab, and tab. Hang on your classroom walls or practice in center time. 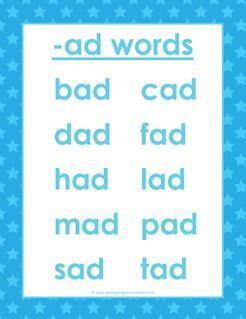 A bright blue cvc words list of -ad words with all the words in the -ad word family: bad, cad, dad, fad, had, lad, mad, pad, sad, and tad. Practice with your kids every day. 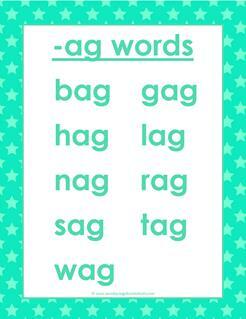 This lighter blue cvc words list of -ag words has all the words in the -ag word family: bag, gag, hag, lag, nag, rag, sag, tag, and wag. Laminate and pass around for kids to read. 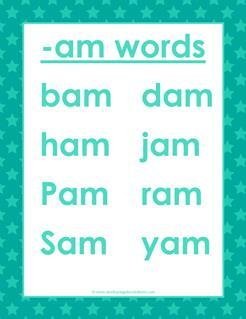 A teal blue cvc words list of -am words with all the words in the -am word family: bam, dam, ham, jam, Pam, ram, Sam, and yam Have kids use a pointer and read every word aloud together. 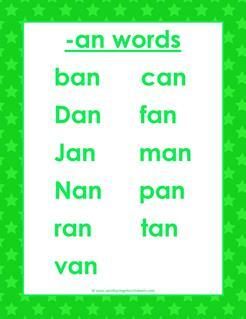 A bright green cvc words list of -an words with all the words in the -an word family: ban, can, Dan, fan, Jan, man, Nan, pan, ran, tan, van. Make a fun rhyme out of all these -an words. A light green cvc words list of -ap words with all the words in the -ap word family: cap, gap, lap, map, nap, rap, sap, tap, and zap. Create a song out of all these rhyming words! 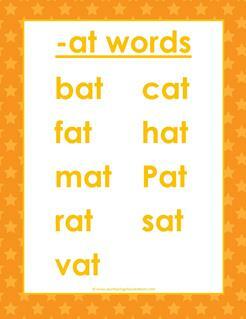 This orange cvc words list of -at words with all the words in the -at word family: bat, cat, fat, hat, mat, Pat, rat, sat, and vat. Read a simple story to your kids with all of the -at words in it. 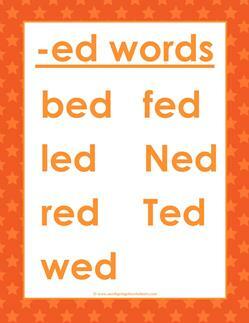 This orange cvc words list of -ed words with all the words in the -ed word family: bed, fed, led, Ned, red, Ted, and wed. Make up some nonsense words that also end in -ed. 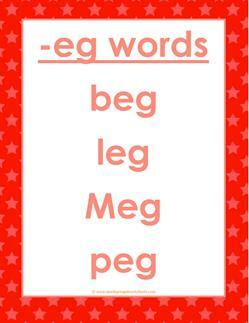 A red-orange cvc words list of -eg words with all the words in the -eg word family: beg, leg, Meg, and peg. Here's a challenge: Write stories using all the -eg words in a different order. A pink cvc words list of -en words with all the words in the -en word family: Ben, den, hen, Jen, Ken, Len, men, pen, ten, yen, and Zen. Can you make more words with -en endings? 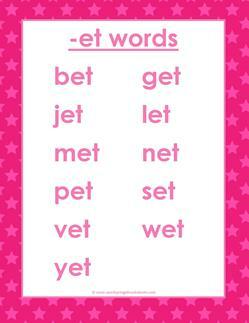 A hot pink cvc words list of -et words with all the words in the -et word family: bet, get, jet, let, met, net, pet, set, vet, wet, and yet. That's a lot of words! Can you whistle all of them? 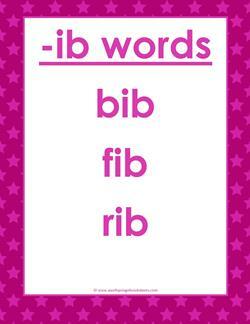 A dark pink cvc words list of -ib words with all the words in the -ib word family: bib, fib, and rib. Have fun and create more -ib words! The sillier the better if you ask me. 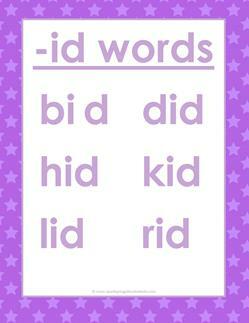 A lavender cvc words list of -id words with all the words in the -id word family: bid, did, hid, kid, lid, and rid. Here's a good idea! Have your kids write these words in rainbow colors. 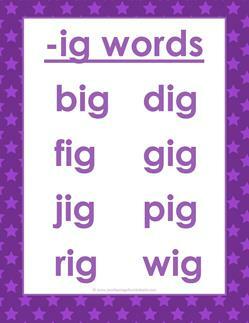 A lavender cvc words list of -ig words with all the words in the -ig word family: big, dig, fig, gig, jig, pig, rig, and wig. You and your kids can write these words with your finger in the air. 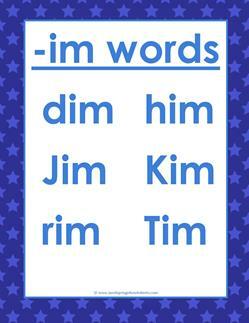 A deep blue cvc words list of -im words with all the words in the -im word family: dim, him, Jim, Kim, rim, and Tim. Say the beginning sound and have kids tell you the whole word. 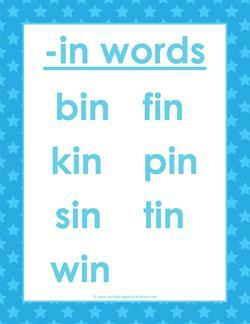 A bright blue cvc words list of -in words with all the words in the -in word family: bin, fin, kin, pin, sin, tin, and win. Great book - "There Once was a Man Named Michael Finnegan"! 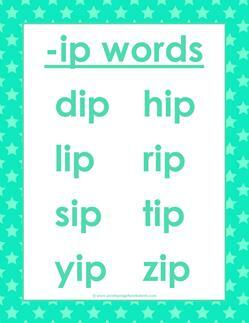 A light blue cvc words list of -ip words with all the words in the -ip word family: dip, hip, lip, rip, sip, tip, yip, and zip. These are good words for a dog story: "Zip your lip and don't yip!" 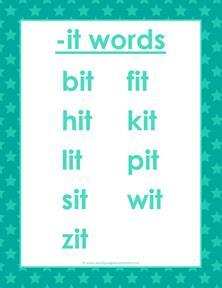 A teal blue cvc words list of -it words with all the words in the -it word family: bit, fit, hit, kit, lit, pit, sit, wit, and zit. Cover the -it with a post it note, have kids say the word and take post it away. 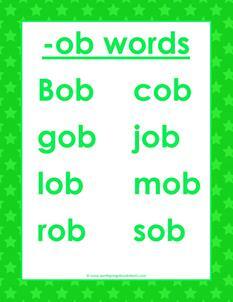 A bright green cvc words list of -ob words with all the words in the -ob word family: Bob, cob, gob, job, lob, mob, rob, and sob. Say a word on the list and have a child point to it. 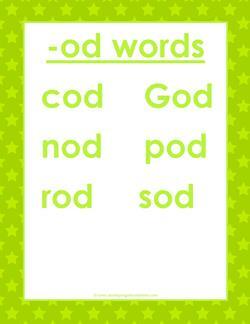 A light green cvc words list of -od words with all the words in the -od word family: cod, God, nod, pod, rod, and sod. Make a song out of these words an do a little dance to go with it! A yellow cvc words list of -og words with all the words in the -og word family: bog, cog, dog, fog, hog, jog, and log. Write each word sounding out each letter then say the word. 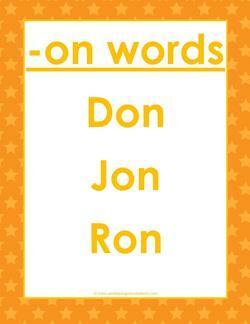 A light orange cvc words list of -on words with all the words in the -on word family: Don, Jon, and Ron. Can you come up with some silly names with the -on ending? Bet you can't! 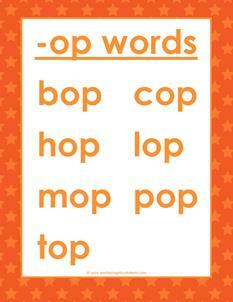 A orange cvc words list of -op words with all the words in the -op word family: bop, cop, hop, lop, mop, pop, and top. Pull out a copy of Dr. Seuss' Hop on Pop and read away. 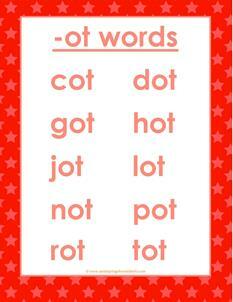 A red cvc words list of -ot words with all the words in the -ot word family: cot, dot, got, hot, jot, lot, not, pot, rot, and tot. Well, bly'me! Count 'em then tell me how many words on th' page! A light pink cvc words list of -ub words with all the words in the -ub word family: cub, hub, nub, rub, sub, and tub. C'mon everybody - put your sub in the tub and rub-a-dub, dub! A pink cvc words list of -ud words with all the words in the -ud word family: bud, cud, dud, mud. Only the word bud sounds appealing. But if you're a boy, then mud sounds like fun! A dark pink cvc words list of -ug words with all the words in the -ug word family: bug, dug, hug, jug, lug, mug, pug, rug, tug. Try and say these words as fast as you can. Ready, set, go! A dark blue cvc words list of -um words with all the words in the -um word family: bum, gum, hum, mum, sum, yum. Don't just sit and say "Ummmm", say the -um words! 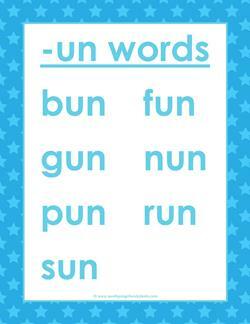 A light blue cvc words list of -un words with all the words in the -un word family: bun, fun, gun, nun, pun, run, and sun. Have some fun and use a pun while reciting the -un words! 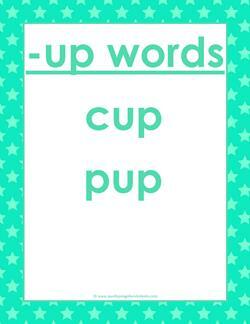 A light blue cvc words list of -up words with all the words in the -up word family: cup and pup. Can you draw a picture with a little bitty pup in a great big cup? 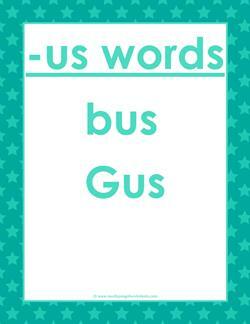 A teal blue cvc words list of -us words with all the words in the -us word family: bus and Gus. Since there are only two words you can make a simple sentence like this: Get on the bus with Gus. A green cvc words list of -ut words with all the words in the -ut word family: but, cut, gut, hut, jut, nut, and rut. Kids may need to be clear about this but and what a jut and a rut are.